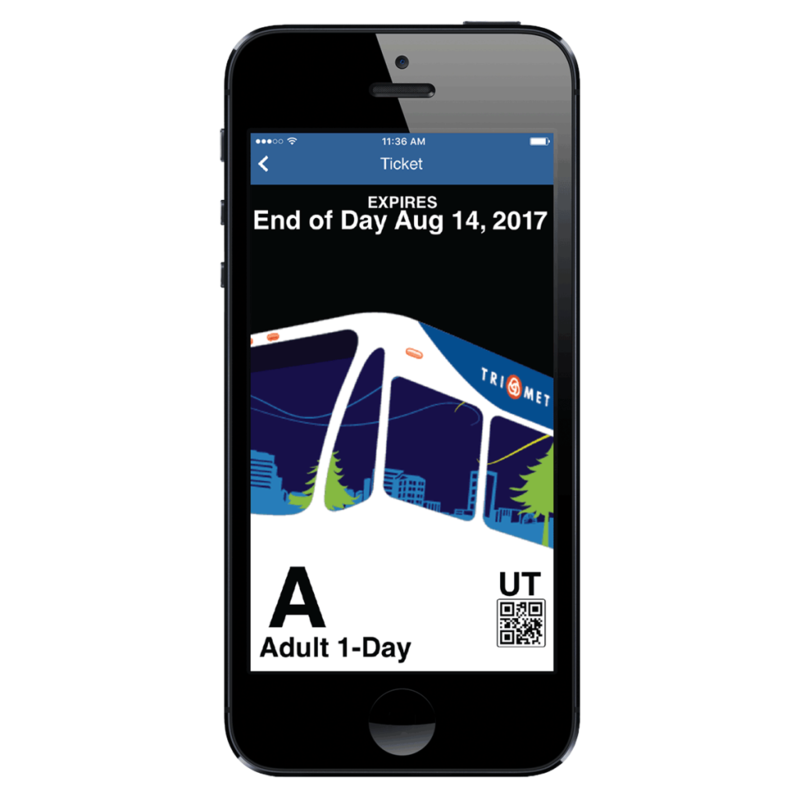 TriMet encourages riders to make the switch to Hop Fastpass® as we plan to no longer accept most non-Hop tickets after Dec. 31, 2019. That includes unvalidated 7-, 14- and 30-day passes; unvalidated, foil-stamped paper tickets and passes; and mobile tickets from the TriMet Tickets app. We will, however, continue to sell validated paper ticket receipts printed on buses and LIFT tickets and passes. 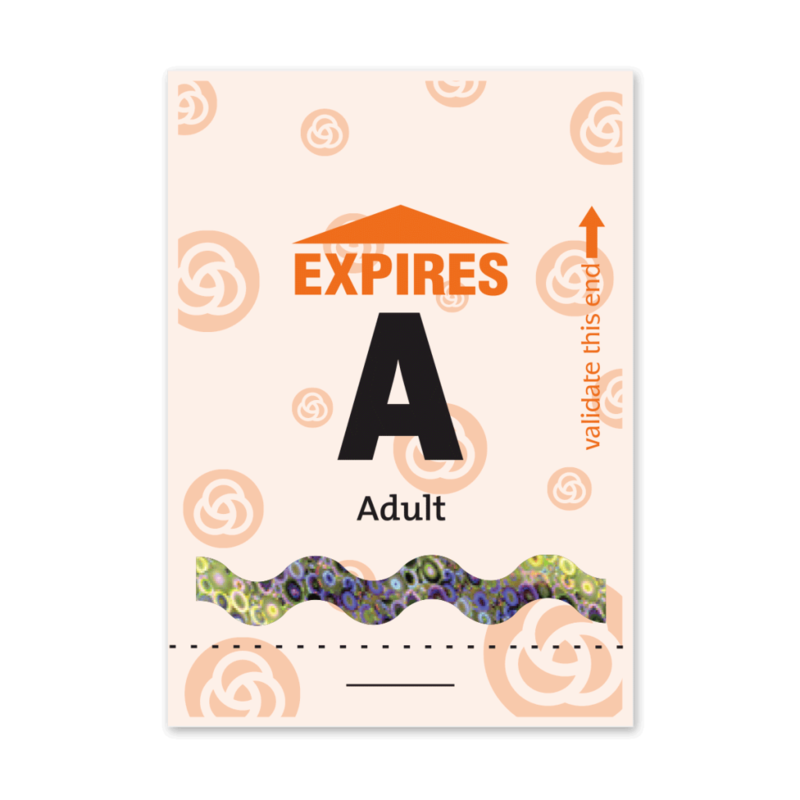 In May, the TriMet Board of Directors will consider the elimination of multi-day passes (7-, 14- and 30 day) since those are no longer needed now that the Hop system gives riders the ability to earn passes as they ride. With the Hop electronic fare system, never pay more than you should to use transit. Earn month passes as you ride without an upfront cost. Avoid paying for rides not taken. Register your Hop card and your money is protected when you report a lost card. Enjoy easy options to reload money anywhere, at any time. Hop offers many ways to pay fare. Just remember to tap for every ride. It’s your proof of fare. Physical Hop card – Purchase a plastic Hop card or load value at 500 retail locations across the Portland metro area. Some locations are cash-only or load-only, so check before you go using the interactive map at myhopcard.com. Virtual Hop card – Apple has announced that this spring, customers will be able to add their Hop card to their Wallet on their iPhone or Apple Watch. Android users can already download a virtual Hop card available in Google Pay. Apple Pay, Google Pay and Samsung Pay – Any smartphone equipped with Apple, Google or Samsung Pay, linked to a valid bankcard, can be tapped to a Hop reader to pay the fare. While paying this way does not provide all the benefits of a physical or virtual Hop card and you can only buy an Adult fare, it is a convenient option for those who don’t ride often. Hop tickets — All of our ticket machines at MAX and WES stations have been converted to Hop ticket machines. The machines dispense 2 ½-hour or one-day, disposable Hop tickets. Hop tickets can’t be reloaded. Tap them to a Hop reader with every trip and transfer. TriMet wants to help you get on board with Hop. Exchange your unvalidated, foil-stamped Adult, Youth and Honored Citizen 2 ½-Hour tickets and 1-Day passes for money loaded onto a free Hop card. There is a $250 limit on Hop cards. Only eligible TriMet fares can be exchanged. 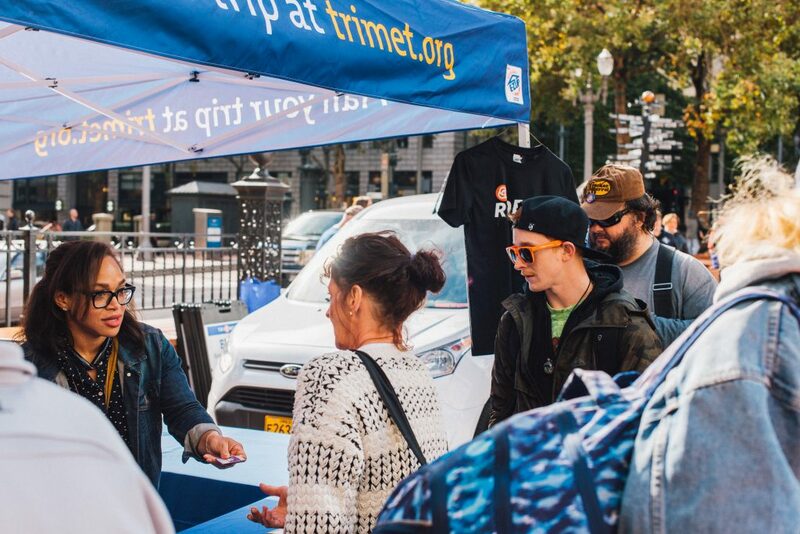 At the TriMet Ticket Office – Staff at the TriMet Ticket Office can exchange your unvalidated, foil-stamped tickets Monday through Friday, between 8:30 a.m. and 5:30 p.m. The value will be loaded onto a Hop card. If you already have a Hop card or a virtual Hop card, we’ll credit the value of the tickets to your existing account and there will be no fee. At a ticket exchange event – We’ll be hosting special ticket exchange events throughout the year where you can exchange your unvalidated, foil-stamped tickets and get the money stored on a free Hop card. Visit trimet.org/ticketexchange and check our TriMet Facebook page from time to time to check for events. *Note: Up to $250 in unvalidated foil-stamped tickets can be exchanged. So far riders have used ticket exchange events to transfer nearly $30,000 in tickets to Hop cards. Another option: Simply use your remaining paper passes and then make the switch to Hop. 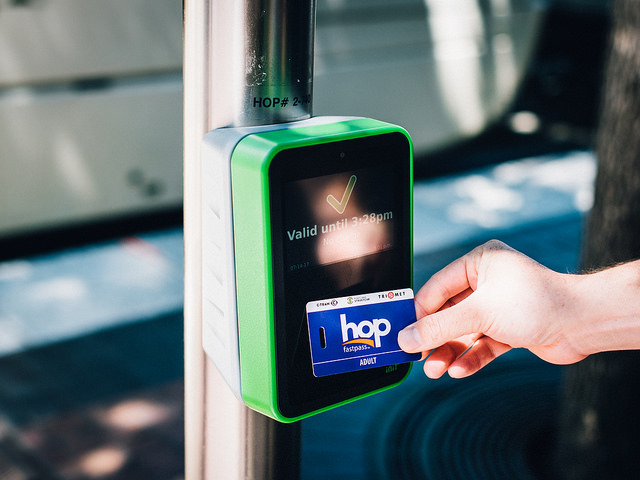 Hop is the next generation of transit fare, offering a cash-free, hassle-free option that’s valid throughout the Portland-Vancouver metro area. Use it to pay fare on TriMet, C-TRAN and Portland Streetcar. Just visit one of the hundreds of retail outlets that sell Hop cards, including grocery and convenience stores, pharmacies and transit ticket offices. Buy an Adult, Honored Citizen or Youth Hop card. Load fare in the store, at the TriMet Ticket Office, online at myhopcard.com or by calling 1-844-MYHOPCARD. You’re ready to ride! Just remember to tap your card at the green Hop reader on board buses and streetcars, and on MAX, WES and Vine platforms. Go to myhopcard.com to learn about Hop, including answers to common questions, how-to-videos and more!